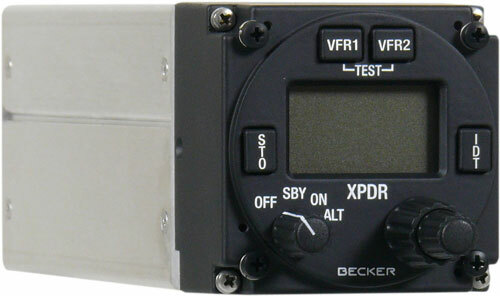 The BXP6401-1-(01) is a compact and lightweight single block Mode-S transponder. It is certified according to ETSO-2C112a and is suited for VFR and IFR operations up to 50000 feet. The transponder is equipped with extended squitter and SI code function and it provides an interface to the central aircraft data system. It allows ELS, supports EHS, as well as ADS-B via extended squitter. New AR6201 VHF-AM Transceiver with 8.33 kHz channel spacing and integrated intercom Becker Avionics introduces its new high performance, compact, AR6201 VHF-AM Transceiver with 8.33 kHz channel spacing and integrated voice activated (VOX) intercom system for up to four passengers. The AR 6201 continues the legacy of its predecessor the AR4201 VHF-AM transceiver, which has set the benchmark for reliability and performance. With more than 18.000 units sold, the AR4201 has been the trustworthy companion for thousands of pilots flying millions of flight-hours. The new AR6201 is built using state-of-the-art DSP (Digital Signal Processing) technology resulting in a highly efficient transmitter and very sensitive receiver. The AR6201 represents a quantum leap forward in technology, performance, technical sophistication and robustness. The BXP6403 is standard width Mode-S transponder designed for slide-in mounting (tray available). The use of an adapter (available as accessory) allows for retrofit in a KT 76 A tray. It is suited for VFR and IFR operations up to 15,000/50.000 ft (Class I or II). The sunlight readable display can be illuminated and dimmed for night operation. TSO Certified.